What Are the Causes of Brown Spots on Apple Skins? A crisp, uniformly colored red, yellow or green apple (Malus pumila) is desirable, so it's disappointing to discover ugly brown spots on the skin of the fruit. 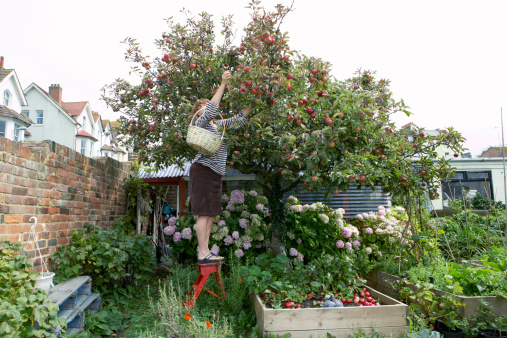 If you grow your own apples, which are hardy in U.S. Department of Agriculture zones 3b to 8b, it can be doubly disappointing because you've lost some of your crop. There are numerous reasons why apples get brown spots on the skin, and knowing the signs and symptoms can help you diagnose and treat the problem before your apples are ruined. A variety of fungal diseases can cause brown spots to develop on an apple. Bitter rot causes sunken brown spots to form, and flyspeck is caused by a sooty fungal infection and causes superficial spots to form on the skin, according to the University of Kentucky College of Agriculture Cooperative Extension Service. Cedar quince rust causes discoloration of the skin, as well as brown spongy areas right under the skin. The fungus responsible for apple scab also causes brown lesions. Bitter rot, black rot, white rot and sooty blotch are additional fungal diseases that can cause brown spots on apple skins. Tarnished plant bugs feast on the leaves and fruit of the apple tree and can cause corky, discolored spots on the bottom of the apples. Green fruitworms tunnel into apples, and the surrounding areas can turn brown. San Jose scales leave behind small spots that look similar to measles, according to North Carolina State University. Codling moths leave behind distinct brown spots where they burrow into the fruit. Once apples have been picked, they must be stored properly to keep them crisp and free of blemishes. If you store apples at cold temperatures for more than two months, they can begin to grow brown spots, and this type of discoloration is called storage scald, according to the Clemson University Extension. This occurs because the cold temperatures cause oxidative damage, which is when the apples are exposed to more oxygen than they can absorb. 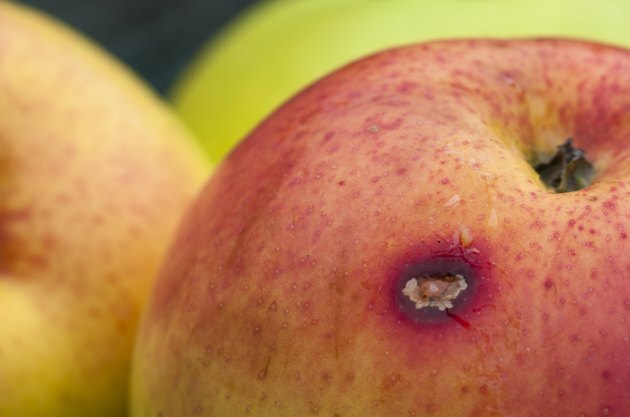 Bitter pit occurs when apples are stored for long periods of time at cold temperatures and causes discoloration on the skin of the fruit, as well as brown spots on the flesh. Sodium burn, which occurs when sodium hypochlorite contaminates the apples when they're washed prior to distribution, can also cause brown spots on the skin. Keeping apple trees pruned and maintained can help cut down on fungal diseases, according to the University of Florida Extension. Introducing predatory insects, such as parasitic wasps, into your yard is one way to help control insect pests that cause brown spots, though they aren't always completely effective, especially for codling moths, according to the Colorado State University Extension. Pheromone traps can also destroy insect pests. Insecticides can be useful, as well. For example, acetamiprid can kill several insect pests on apple trees, and it's ready to use from the spray container you purchase it in. Wait at least seven days to harvest the apples and 12 days to reapply the insecticide. Eating apples within a week or two of purchase or harvest will make spots from cold storage less likely.